Inspiration can come from anywhere. Nearly every design challenge begins with some exploration and search for inspiration. Today, Eamonn Meagher shares about where he finds inspiration. 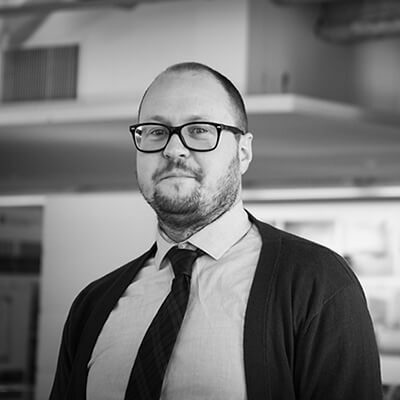 What interests me most about the practice and profession of architecture is how directly connected it is to people; their lives, senses, emotions, and how through design, architects can have a positive (or negative) effect on society. In our culture, I’ve found the things that most excite and inspire my own creativity are forms of art that explore theses connections, which for me is most relatable to sci-fi and cyberpunk films. Cyber punk is a sub-genre of science fiction that is defined by a futuristic dystopian society, juxtaposing extreme wealth and advanced technology with poverty and the destruction of social order. William Gibson’s 1984 novel Neuromancer is typically regarded as defining the genre, but Ridley Scott’s 1982 film Blade Runner is widely agreed to be the first cyber punk film. While I like Blade Runner, my preference is Dennis Villeneuve’s 2017 follow up Blade Runner: 2049. I find there is a more nuanced exploration of the building environment in Blade Runner: 2049 compared to the original. As an audience we follow the main character K, played by Ryan Gosling, to a great number of locations in the film’s futuristic dystopian vision of Southern California and other locations. My favorite scenes take place in the abandoned ruins of Las Vegas, shrouded in an amber haze of nuclear fall-out. The sepia hue that filters over the landscape provides an oddly comforting blanket over the environment that evokes a sense of protection and seclusions among the ancient Egyptian-like monumental ruins. Later, in an abandoned resort casino theater, K and Dekkard, played by Harrison Ford, fight amongst the darkness, lit only by sporadic stage lights, translucent show girls and Elvis holograms. The exploration of light, hue, transparency and reflection throughout the film engage the viewer visually. The Las Vegas scenes combine many of these elements that seamlessly integrate these plot points into uninterrupted chapters of the story. Blade Runner: 2049 is a recent example of a cyber-punk film, but Stanley Kubrik’s 1968 2001: A Space Odyssey is another visually stunning and spatially inspiring film – from the multi-axis shots of characters walking on the ceiling, walls and floors, in a gravity-free spaceship, to the Monolith and it’s suggestion that powerful ideas and influence can be contained within simple objects and concepts. 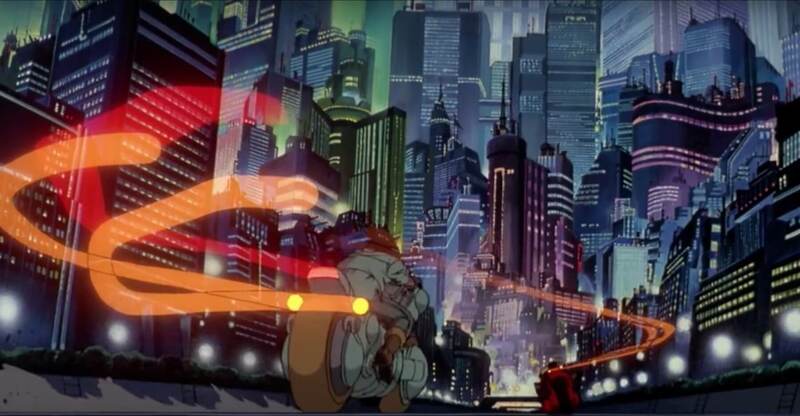 Finally, the 1988 animated film Akira, directed by Katsuhiro Otomo, based on his manga, a Japanese comic and graphic novel, of the same name, displays a visual representation of light and form that is at once both diagrammatic and realistic. Some of the best examples of this are displayed in the head and tail lights of the motorcycles in the opening chase scene. Most impressive is the animation of the tail lights that carve a still and stagnate path of the bike as it races away and slowly fades as the bike rides out of sight. This animation style, while not physically accurate, represents more accurately our perception of light than a more physically, scientifically accurate animation could. I don’t often find myself inspired, at least not in the romantic, dictionary definition sort of way, and certainly I’m not inspired to duplicate the dystopian worlds I see in the films described above. However, the exploration of light, imagining space and form influenced by new technology and the recognition that what we build as architects have real and important effects on our society, certainly motivates me to be positive influence on our built environment.